We first learn physical decompositions methods. Some matters charged by friction attracts other matters. When plastic or glass rod charged by friction, they attract black pepper in the salt black pepper mixture. Magnets can attract some matters like iron, nickel. On the contrary, some of the matters like glass, wood, sugar are not effected by magnets. You can decompose mixtures including metals, iron etc. Solid-liquid mixtures can be decomposed by this method. For example, water-sand mixture can be decomposed by using filter. Two solid matters having different densities can be decomposed by mixing them with liquid. 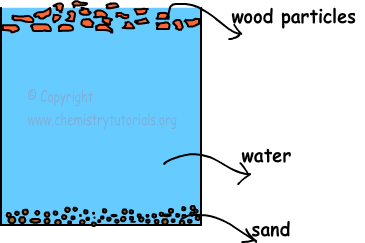 Matter having higher density falls down to the bottom of tank and matter having lower density swims. For example; sand and wood are mixed with water. Sand falls down to the bottom of the tank and wood particles swim. Solubility of matters in one solvent are different, using this difference we can decompose mixtures. For instance, if we put sugar and flour into the water tank, sugar can solute in water but flour can not solute water, using this method you can decompose mixtures. One liquid and one solid mixtures can be decomposed using their different boiling points. For example, salt and water mixture is boiled, water evaporates and we get salt at bottom of the tank. If we also want water, we can condense it after evaporation in another tank then we get salt in one tank and water in another tank. Two liquids are also decomposed using boiling point difference. Liquid having lower boiling point evaporates first and decomposed. In decompositions of compounds, chemical methods are used. In general, energy given to compounds during this process. Electrolysis is a method in which, compound mixed with liquid and two metal rod placed into this mixture. Electric current is applied to this mixture and make compound decompose its elements. Positively charged ions are collected in the cathode (one of the metal rod) and negatively charged ions are collected in the anode.